This is one of those situations where the more I've enjoyed a book, the less I want to talk about it on here, lest I give something away. 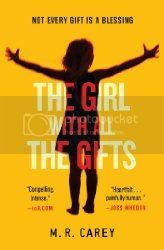 The Girl with All the Gifts is one of those books that you really need to just go into blind, and let it reveal itself to you, chapter by chapter. There's honestly a part of me that is already wishing that I could go back and read this again, for the first time. When Orbit started promoting this book on Facebook by releasing it one chapter at a time, I was hooked from the first chapter. Seriously, I couldn't wait for each chapter to be unlocked to see what was going to happen next. When I was presented with an opportunity to read an ARC of the book, I jumped at it. I'm hoping each of you jumps at a chance to read it as well. M. R. Carey has created a terrifying world in which Melanie lives. There is something special about Melanie, but even she doesn't understand how special she is. As events begin to unravel quickly in Melanie's life shortly into the book, we embark on a journey with her as she grows and begins to understand herself and her place in the world. This is a true coming-of-age story, but one that you have probably never imagined. The Girl With All the Gifts is so much more than this, though. It definitely is not for the faint of heart, as this book sits firmly between the science fiction and horror genres. You may be horrified by some of the events that happen to and around Melanie, but the story and Melanie's journey are worth it, all the way to an ending I did not see coming but in retrospect seemed inevitable. And I'm fearing that I'm already giving to much away. Carey has taken a current trope and turned it on its head, in so many ways. I seriously wish I could tell you ALL THE THINGS about this book, but I simply can't. You just have to trust me. Trust me that this is a horror story filled with heart and hope. Trust me that I'd love to sit down with you when you finished it, to talk about it more. Trust me that this book is entirely worth picking up. Finally, trust me that you probably haven't read anything like it before. This will be a book that I know I will be returning to time and again.